Does February feel kind of “blah” to you? You’re not alone. The February Funk is rough for many people, and not just for those of us living in Loveland. Millions of Americans are affected by seasonal affective disorder (SAD) each year, and February is one of the peak months for people to feel a bit glum. It’s easy to start counting down the days until warmer days and summer nights, but this isn’t a great way to spend your time. If you’re constantly thinking about what’s ahead, you’ll be missing out on the wonderful moments in the present. That’s why our private school has compiled a list of things to do in the dead of winter. Take a look at some things to do in February and March, and look into the many activities Resurrection Christian School has to offer! Begin the enrollment process today for the upcoming school year. Being active in winter can seem like the last thing anyone wants to do, but it’s actually a great opportunity to try something new. Loveland and Fort Collins have tons of climbing gyms that are an excellent activity for kids and adults alike — check out Ascent or Whetstone in Fort Collins, or Wooden Mountain here in Loveland! Now’s also an ideal time to get back into (or start up) yoga, and it’s pretty easy to find a family-friendly studio. Dance classes, basketball, or other sports are a great way to stay fit, healthy, and happy throughout the winter. As far as outdoor activities go, you might feel like skiing or snowboarding are your only options — and both are definitely an amazing sport for so many people to enjoy. However, countless others are not fans of the driving involved to get to the mountains, the ski passes and lift ticket prices, or the sports themselves. That’s OK too. You can rent snowshoes for pretty cheap, and it’s easy for anyone to try (while still being a good workout)! When it’s cold out, we often retreat to our homes instead of venturing out. After all, who really wants to scrape their car, wait for the heat to warm things up, bundle up in countless layers, and be outside at 5 p.m. when it’s already pitch black out? But keeping up on fitness makes you feel better and makes the winter months go by faster. If your child is already enrolled at our private school in Loveland, be sure to look into upcoming sports they can partake in! Being creative is one of the most important parts of life, but it can take us a lot of time and effort to really get ourselves going. Whether you want to take up painting, pottery, woodworking, knitting, or anything in between, now’s a good time to do so. You can even start your new hobby with a friend or loved one to make it more fun, while also holding yourself accountable. As fun and easy as this sounds to take on a new project, starting up a hobby takes a good amount of motivation. It’s so much easier to veg on our phones than it is to start something that requires work and concentration. But ultimately, hobbies are more fulfilling and provide us with more joy. Once a week, schedule a block of time that’s dedicated to working on your craft, and put the phones and tablets away. Every month in winter, you and your family should have something fun planned that everyone can look forward to. Ideally this is the case every month, but it’s good to make it a priority at the beginning of the year! It could be a mini-vacation, like a weekend trip up to Estes, it could be a road trip down to New Mexico, or it could even just be a movie and dinner date with the family. The event itself doesn’t matter as much as the memories and connections you strive to create and strengthen. Putting something on the calendar is a necessary way to excite everyone, and it’s a way to break those winter doldrums. Your family will love having something fun on the horizon. Game or puzzle nights — shut off the TV or other screens and spend some time together in the middle of the week. Cleanup dance party — when it’s time to clean things from top to bottom, blast the speakers with some of everyone’s favorite music. Of course, it’s necessary to make sure dancing is involved. (Make a) movie or play night — break into teams and give everyone two hours to create a script for a play or to make a movie, then watch the results! Switch teams the following week. Something new — it could be checking out a new park, trying a new ice cream spot, or even just making a new dinner recipe where everyone makes something new for people to enjoy (especially good for older kids). Spice things up by choosing a “new” day once a week. You’re not the only one with the winter doldrums! Sometimes it’s best to get people together to lift everyone’s spirits. Invite the extended family over, throw a neighborhood shindig, bring your friends and their kids together, and celebrate! Have a generational party (the ‘70s, ‘80s, and ‘90s are excellent inspiration), an indoor picnic, a luau, a build-your-own pizza event — the sky’s the limit! If you start making this an annual occurrence, it will become something that everyone will look forward to and it will make the winter months a little more special. People will love getting to break through their own winter doldrums by celebrating in style. At Resurrection Christian School, we have so many amazing activities going on, all throughout the year. From sports to clubs and so much more, there’s a ton going on at RCS! But our private school also recognizes that winter can seem to drag on forever, and we know that it doesn’t have to feel this way. 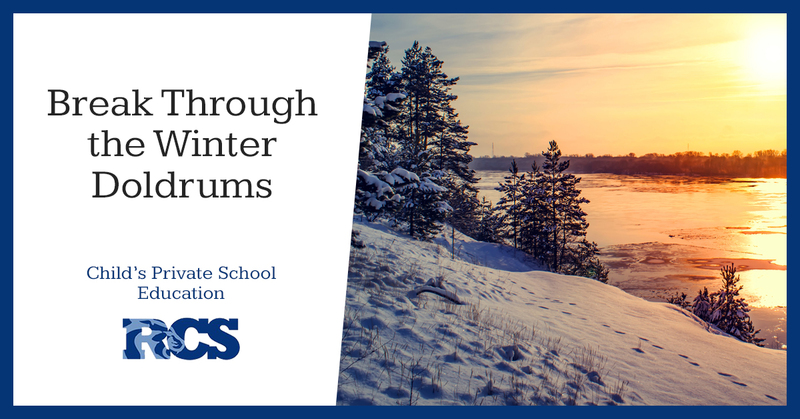 Try out some of these activities with your family to make winters wonderful, and contact our school for questions on elementary, middle, or high school curriculum and admissions! Whether it’s the parents, the coaches, the refs, the fans, or the players themselves, there’s a lot of intensity in private high school sports. Everyone is wanting the same outcome, to win, and they’re willing to do what it takes to make that happen. Competition drives many of us, but it’s also inherently not the kind of Christian mindset that Jesus would want us to have. Jesus doesn’t teach us to beat others or to put others down, and we certainly don’t want to relish interminably in the attitude that we’re the best — this leaves us thinking others are inferior. And yet, we’re not wrong for wanting to win the game or score the winning basket. But where’s the balance? How can we do our best at sports and help our team, while also keeping a Christian mindset? These are some tough questions, but our private high school is here to provide some guidance. High school athletics are an important part of the Resurrection Christian School framework, and we’re proud of our Cougars! 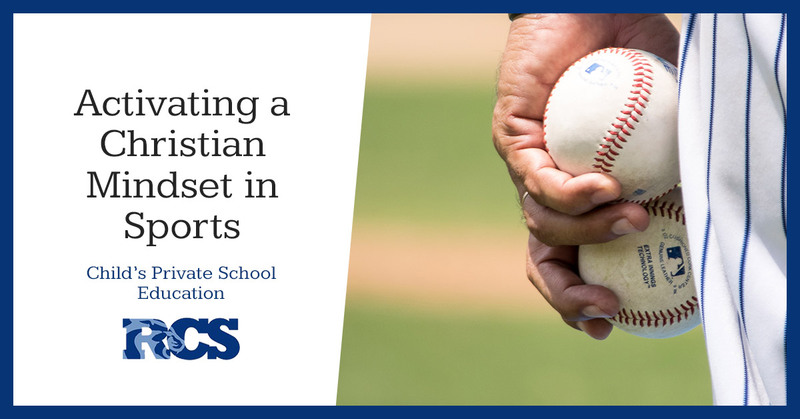 Find some advice on how to incorporate Christianity with high school athletics, and find information on enrollment, admissions, and activities at RCS! When everyone is telling you you’re a star, it’s all too easy to buy into that mindset. Every single person is so special in the Lord’s eyes, and every single person is unique. Staying humble doesn’t mean cancelling out this fact, it’s just recognizing that you are human, and that God is greater than us all. As a high school athlete, you can start practicing humility by thinking about what’s something you did well each game or practice, and what’s something you can improve on. The things you do well shouldn’t always be about goals or points, either. Thinking about how hard you worked, how you incorporated your teammates, or how you dealt with a tough call from the ref are all huge things to be proud of. Similarly, when thinking about things to improve on, consider any attitudes you may have carried throughout the game — towards other players or yourself. Were you too hard on others? Were you talking negatively to yourself? Did you mess up a goal because you weren’t as confident or you didn’t think things through as well as you could have? Staying humble is less about the points you did or didn’t score or the assists you did or didn’t have, and much more about how you approached the game and players as a whole. Refs, like the rest of us, are human, and they will make bad calls. While it’s easy to assume favoritism or purposefully turning a blind eye, the best thing you can do is to forgive and forget. Getting hung up on the plays that could have (or in some instances, should have) been keeps you from growing. The same attitude applies towards your coaches — trust their judgment, and while you can always ask questions and see what they’re thinking, remember that timing and approach is key. Is your coach more open to a conversation when there’s five minutes left on the clock? Or would they be more willing to sit down with you when you’ve cooled down and it’s not in the heat of the moment? Finally, be forgiving of teammates and the opposing team, and be forgiving of yourself as well! Sports can breed some major feelings of inadequacy and resentment, and that’s not what it should be about. Jesus teaches us to forgive those who trespass against us — sometimes that person trespassing against us can be ourselves. Hard times and moments happen. Our private high school wants you to always play your best, whether on the court or off, but we also want you to carrying a loving and empathetic attitude towards all whom you encounter. Takeaway: Every game is a competition, but it’s necessary to treat others with respect. Takeaway: Trophies might seem like the most important thing, especially when thinking about what they represent. However, your love of the game should always be your reason for playing. Takeaway: Don’t give up! This passage doesn’t mean to be salty, it’s all about being true to yourself and persevering. When tough times happen for you or your team, use them as a way to grow. No matter what someone else might be telling you, there is never an OK time to cheat. Honesty absolutely pays for itself, time and again. You don’t want to give your team the reputation of one who doesn’t play fairly. Jesus asks that all of us are honest and open in everything that we do. Make sure you uphold this tenet of Christianity when you’re out there on the field — it will ultimately help you, your character, and even your team in the long run. When our private high school says “accept losses,” we don’t mean to say that you should just give up regardless of the outcome of the game. Instead, we think that sometimes so much emphasis is put on winning that a loss can feel like the end of the world instead of a moment for growth. You are going to lose games — but that’s part of how you get better! The LeBron Jameses and Brittney Griners of the world didn’t become some of the best basketball stars of all time because of nonstop wins. Their success is deeply tied to their losses and how they learned from them. If you treat a loss like the end of the world and a defining moment for you as an athlete and person, you’re not going to get better. You’ll end up feeling pretty stuck and hopeless. If you treat losses like a lesson and an opportunity for improvement, you’ll come away feeling inspired and motivated, and it will absolutely impact your game. As a private school in Loveland serving elementary, middle, and high school students, Resurrection Christian School is committed to bettering the character and education for every child. We want sports to be fun, exciting, motivating, and a source of wellness. When keeping Christianity in mind, this can all happen. Find out more about our athletic programs and inquire about enrollment today! Communication is such an important aspect of life. It can be hard to deduce how best to communicate with your child about the importance of being able to express themselves and talk to other people. As the saying goes “it takes a village to raise a child.” Don’t think that the responsibility of showing your child how to express themselves falls entirely on you. RCS is here to help you teach them healthy ways to communicate and why to develop important communication skills. In our previous blog, we explored the risk of not developing communication skills and some ways you might show them how to communicate better. In this entry, we’ll discuss the various aspects of good communication and how it affects all of us in our day-to-day lives. Expression is a key benefit of speaking out. While this isn’t always a matter of verbal communication, it’s about being comfortable in your own skin. If your teen loves Doc Martens but feels like they’ll be interpreted in a certain way if they wear those, let them know it’s a sign of expression and they shouldn’t care what people think. Expression is an important part of feeling stable and able to talk about what you feel is important to you. This ensures that your child won’t feel the need to express themselves by dying their hair pink down the road because they don’t feel heard. Instead, they’ll dye their hair pink cause they like pink, or they’ll dye it a flattering color because it promotes their professional goals in life. Another major benefit of regular communication skills is being able to describe your feelings and understand yourself on a deeper level. If you can describe an experience you can fully understand it. It’s like a reading comprehension question, but in regard to day-to-day life and how they need to be able to handle different situations. By regularly being able to describe a situation, they’ll get better at viewing it objectively and acting rationally rather than based on what their feelings dictate. That goes hand-in-hand with the ability to explain yourself. If you can talk about your values, beliefs and perceptions comfortable you’ll be able to build more open relationships with the people around you. If those surrounding your teen don’t understand your teen, they’ll feel isolated because they are isolated. But that all starts with them. They need to feel confident enough in their communication skills to address their issues in a room and make it so that other people can understand where they’re coming from. That’s the very basis of healthy conflict resolution. It’s more than being anti-establishment, it’s actually the secret to personal growth. Asking questions doesn’t mean you’re insubordinate to your superiors, it means you seek understanding and you gain a better understanding. If your teen knows why they’re doing something, then they’ll feel happier doing it. People want to know the why behind things so they can rationalize why they have to do it. For example, your teen needs to go to a good school, get a good education and learn how to become a lifelong learner so that they can succeed in the career path they choose. Giving your child the opportunity to communicate first with you equips them to be able to communicate with other people, ask questions and express themselves in a healthy manner so that they feel happier on a regular basis. Having an amazing, private school education that gives you the classical background to communicate concisely and eloquently is the first step any child should take toward success. Whatever path your child chooses for their future career, they need to be equipped to communicate with authority. A classical education can give them the base to explore their world with open eyes and the freedom to speak their minds tactfully. Reach out to RCS, the top rated private school in Northern Colorado to find out more about giving your child the proper building blocks to excel at whatever they try at. Are Video Games Bad For Your Child? The current political environment is rather tumultuous. There’s plenty of he said she saids and a variety of other arguments that have proven more and more problematic as time goes by. One of those many controversies includes whether or not video games contribute to the aggressiveness in children. Many people are pointing to the quote from Jay Hull, the Dartmouth University professor who proclaimed in the press release for his newest findings on the matter that: “If your kids are playing these games, these games are having a warping effect on right and wrong or they have a warped sense of right and wrong and that’s why they are attracted to these games.” However, the quote and most of the contents of the study are often taken out of the proper perspective to support this narrative of “games are bad for kids.” In fact, Psychology Today claimed that most of the discussions surrounding the piece have been in regard to the press release for the study, rather than the study itself. 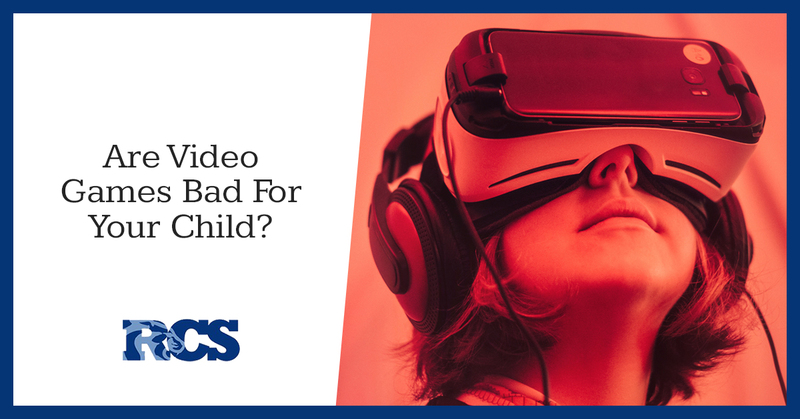 They mention specifically that “It turns out that this is just another example of how social science is often oversold to a public without the statistical knowledge to evaluate problematic claims.” So, are video games really bad for your children? How will they affect their future emotional stability, their success and what sort of effect does it have on the work you’ve been doing to help them earn their classical education from a high ranking private school? The proper question is actually probably does it have any sort of effect at all? In short, no. Learning to read research papers is something that people spend quite a bit of time on, as in they can get a good portion of a college degree merely learning how to properly read research papers and draw conclusions from data. Thus, hoping to be able to grasp these larger concepts as a layman might prove difficult. We’re here to help you slog through the strange terms and redefine some previous misconceptions you might have when glancing over a study similar to the one Dartmouth produced. In the Dartmouth study, in particular, conducted something called a “meta-analysis of studies of youth to see to what degree violent video games contributed to physical aggression.” First, that means, they were basing most of their data off of other people’s data which is not the best way to conduct the scientific method, as you know if you’re familiar with it. Additionally, they certainly make you believe that they’re measuring these youths over physical aggression, like serious acts of violence like homicides, fights and aggravated assaults. However, they only used teen’s self-analysis and confession of feelings rather than actual evidence of aggression. They specifically mention asking how they would respond to “If I have to resort to violence to protect my rights, I will” as a statement that indicated elevated aggression. If you were asked that question, would you say that you weren’t willing to protect your rights with violence? Probably not. Does that mean you’re an aggressive individual? Also, probably not. For that big claim Dartmouth’s leading professor made, it’s rather shocking in comparison to the data he managed to collect. The study itself even mentions that only 1% of youths self-reported in an increase in feelings of aggression, let alone physical representations of actual aggression. This is actually an example of a quite common phenomenon among social science research. For example, if you ask people if they play “violent video games” and then you proceed to ask them how angrily they’ve broken things, those points of data tend to drift toward each other, but that doesn’t mean that’s an accurate way of pulling this sort of data. It’s like asking someone you’ve never seen if they’re white, if they’ve been around people of another race and then asking them how they feel about that race and assuming that that’s an accurate metric of how is racist and how isn’t. The first set of questions creates a bias toward the response of the second question. Psychologists and other scientists alike have expressed that most of these studies, including this one, does not include any more useful information than a Buzzfeed article which is why they have similar headlines. RCS is dedicated to getting to the bottom of things and seeking new knowledge together. With an emphasis on community values, Christian sense of ethics and a classical well-rounded education, we’ve created an exceptional private school experience for you and your child. Check out our carefully crafted curriculum and enroll now to join us in our collective pursuit of knowledge and ways to make our children’s lives better. Being a parent is stressful. You have quite a bit on your plate, but most importantly you need to concern yourself with the most important investment of your life: your child. Your child’s well-being is one of the most important parts of your everyday life and once you have their basic needs covered, your mind will start to wander toward your child’s emotional development. With so many folks online talking about their abusive childhoods and how easy it is to make a small mistake in regard to rearing your child. 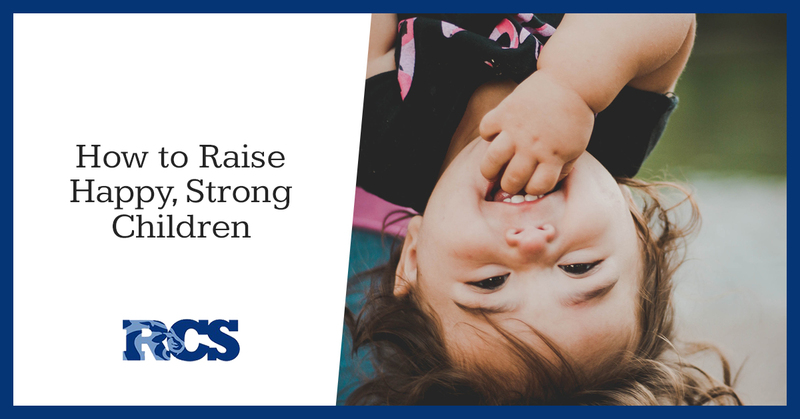 So how do you ensure you’re raising a child that will be as resilient as they need to be? Start off with always having their success in mind. If they’re enrolled at RCS, you’re probably already on the right track. We’re sure you’ve seen the various Facebook posts about how controlling parents can damage a child’s long-term emotional development. There are some studies to back up this assertion, but they mostly come in the form of encouraging a successful child. The leading parenting expert in the UK, Sue Atkins, claims that adults who are successful felt in control in their childhood. There are also several strong examples of children succeeding based off of strong, close relationships with their close relatives and people they love. If they feel valued and have control over their lives and the direction they’re going in, they’re far more likely to succeed than children who are constantly urged in the opposite direction of the way they want to go. According to the same leading parenting expert extrapolated that children who won’t have much in the way of emotional stability as adults don’t feel connected to others, don’t feel like they count, and don’t feel capable of taking care of themselves. Most importantly, however, is that children have to feel courageous and brave in order to accomplish their goals and be stable as adults. Why Are These Attributes Important? Having the above attributes in both children and adults gives us a positive attitude about life. Quite simply put, it gives the whole thing purpose. The idea is that these four basic building blocks that create a sense of security for the child will certainly promote a “Can Do” attitude later in life, which will render them capable of handling the things that life throws at them. The hope is that children with these advantages will become responsible, happy, and self-reliant. Naturally, as a parent, finding these attributes in your child will be a relief. As it means you’ve done your job fundamentally well. In most cases, a human’s ability to both survive mentally and physically relies largely on the ability to connect to others. To put it simply, we move from being infants who are totally dependant on others to being interdependent on others, because that streak never quite leaves. With strong connections to the important people in the child’s life, they’ll be able to thrive and feel secure in their endeavors because there’s always something to fall back on. The easiest way for you to foster a sense of connection between you and your child as well as help them build a support system of their own starts with creating a community for them. Wouldn’t you want the community to be more centered around Christian values and the love of education and the pursuit of knowledge? Enroll your child at RCS to receive the private school level of education while tapping into a community where your child can feel supported and safe and thrive throughout the rest of their emotional development. A classical education is rooted in the idea of training the mind to think critically. This method is supposed to create lifelong learners. As we know, industries change at the speed of light nowadays. If you aren’t a lifelong learner and you’re rather set in your ways, it’s unlikely that you’ll do as well as you can in your career field. As a parent, we’re sure you’re invested in the future of your child and you want them to succeed. 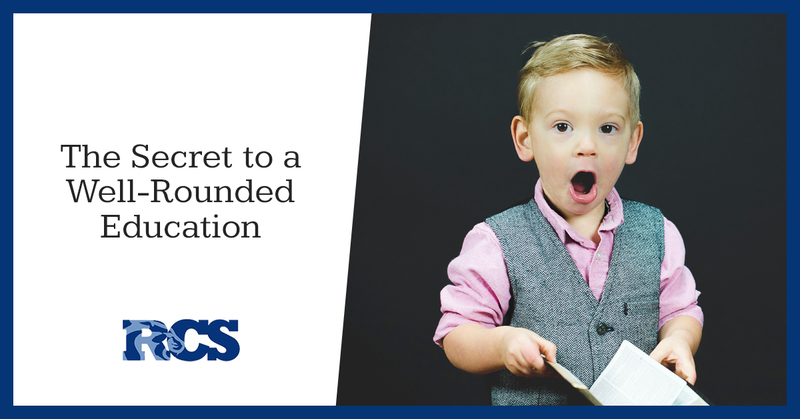 If you’re like most parents, you might even go so far as to take some time pondering how exactly you can give your child the right foundational education to ensure that they thrive throughout their whole life. In most cases, we urge you to invest in a well-rounded, classical education like the one we offer at Resurrection Christian School. Our private schooling education makes a difference in our alumni’s lives because we teach a curriculum that encourages a love of learning and knowledge and encourages rather than forces learning. 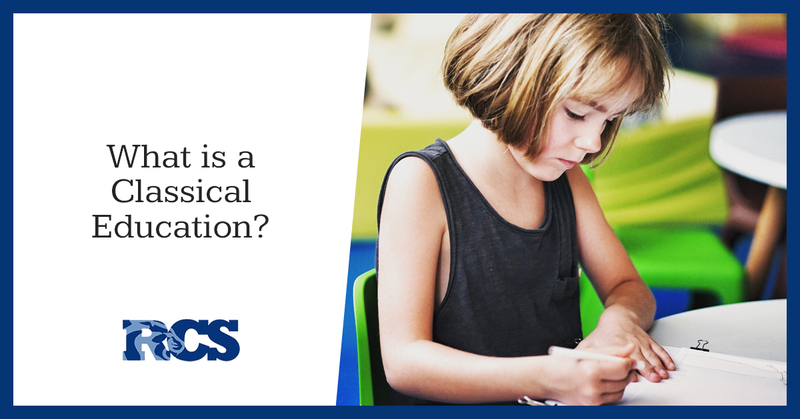 Below, we’ll continue to explore what a classical education is, and how it can benefit your child in it’s teaching structure. Do you have a love of reading? How was it fostered? By forcing yourself to read anthologies regarding history and mathematics? Or did it start with something you learned to enjoy? Perhaps it was a piece of classical literature or something similar, but whatever it was, it had the proper effect. Your love of reading has followed you through life and rendered you a more capable individual in all of your interests regarding hobbies or your career. So how do we foster this similar love of learning and pursuit of knowledge in young minds? Through a tried and true three-part process called the trivium. Where traditional classical educations often begin with merely learning the facts a regurgitating it, more modern classical education studies center on creating a love for the learning while still improving the fact so that the child can have a solid foundational knowledge of simple mathematics and language operations before beginning to play with these pursuits. Uncreative administrators of the classical education view the first portion of a classical education as the “grammar stage.” But if you compare it to the original idea of a classical education, it’s rather unrelated. The original version of a classical education included advanced studies of different languages which would bolster the child’s skills at learning languages later in life and easily and successfully turn them into lifelong learners. Interestingly enough though, one of the main basics of the original classical education, in the sort that kings and queens, as well as higher-ups in the various courts all over the world, learned first was philosophy. The notion was that the child would be able to learn how to apply philosophical ideas to everyday life and have a better handle on human behavior as well as language and interactions than otherwise. As important as it is to create a strong foundation for your child’s learning is, the various ways to get there should be acknowledged and analyzed. Our curriculum leaves room for you to interpret how you want your child’s private education, that is in truth a classical education, to proceed. The grammar stage lays the foundation for the rest of your child’s learning, so ensuring that it’s starting out in the way you’d like it to is important. Check out our curriculums for early childhood learning development and feel free to ask RCS questions about our teaching methods and our philosophy surrounding the classical education you’re investing in for your child. Don’t enlist your child in public school and roll the dice on their education. Enlist your child in a high-quality learning institute that will help you foster a love of knowledge and the desire to always seek more. Start on the right foot starting today. We provide Christian centered, well-rounded education that bolster your child’s chances of success and much more. We’re passionate about sharing knowledge with your child and ensuring that they don’t struggle, but thrive in their academics. Reach out to us now. If you’re pondering enrolling your child in private school, you’re probably aware of the value of being a learned individual in the 21st century. In fact, for the past hundreds of years, being someone with plenty of book smarts, and being equipped with a whole, well-rounded education is an advantage that can’t be matched by much. Setting your child up for life includes a myriad of things, like saving for college, teaching them moral obligations, but it also comes with more subtle lessons and tasks. Sometimes, instead of being able to derive some of the most important lessons from various texts, you’ll need to employ experience. As a parent, there’s a whole host of ways that you can access experiences for your child to partake in. For culture and other finer things can only be appreciated after you’ve fostered an appreciation for the ideas of them. Architecture isn’t stunning if it seems commonplace to your child. To form our ideals of a well-rounded education, we’ve included the study of Christian religions, and the includes the things that bolstered the Christian religion like an acknowledgment of the hardships of yesteryear and how far and long the good book has traveled to be a scripture to this day. Encouraging a sense of awe for how many years the scripture has survived can begin by encouraging an appreciation for the other accomplishments from human-kind. The best way you can combine the principles of awe in regard to our accomplishments as well as create new experiences for your child is travel. There’s nothing quite like going to a new and completely different place to help you really get a sense of how other people live and how their culture formed as opposed to our own. We’ve collected some of our favorite locations to visit to improve your child’s view of history and the incredible expanse of years between us and the monuments that miraculously still stand today. It’s certainly something to seethe birthplace of the Christian religion as well as the birthplace of modern civilization. Rome is home to buildings that are painted the colors of the sunset, with little, rough-hewn cobblestones that are interrupted by little green sprouts that poke up between each cobble. The buildings are all decorated with carved angels, crown molding painted crisp eggshell white and columns with holes drilled into the stone to extract the ancient Roman’s extra support metal that went through the center for more industrial purposes over the centuries. You can peer at the huge chariot ring, with huge modern and ancient buildings built up around its rim, with a gorgeous carved fountain browning the center of the arena and some remainder of the old stadium seating lingering at the elongated curve on either edge. You can walk among the seats of the Coliseum and see the stone crumbling from thousands of years of weathering and use. Pass through catacombs filled with bones and prayers from long-dead lips carved into the walls near the crypts. You can even peer over certain railings along the sidewalk and look down into the depths of what the city once was, as Rome has rebuilt itself on the remains of its old buildings from its start. You can peek through years of history and watch the city evolve through layers, now covered with moss and foliage, but still visible. It’s a stunning area, and the mixture of modern culture in tandem with the undertones of thousands of years of history makes a culture that’s entirely unique from ours. Once you get past the surface beauty of such a remarkable place, it’s still a perfect opportunity for your child to get the experiences they need to earn that well-rounded education you’re hoping they’ll have by the time they’re an adult. With the additional knowledge that they can gain from their experiences at Resurrection Christian School, they’ll be able to form opinions about the history they’re walking through. They’ll be able to appreciate the Borgia apartments when they tour the elaborate frescos within the walls of the Vatican as well as marvel at how well the Catholic church has managed to preserve hundreds of years of history for mankind. They’ll get to observe piazzas from ancient Rome that have completely encased and preserved by the Vatican as well as the magnificent art from renaissance artists that have managed to survive for the past 600 years because of the marvel of organized Christianity and an appreciation for humans as they are made in God’s image and love the joy of creation. Seeing pictures is never enough in regard to the wonders of art and architecture and human creation. Experience is far preferred and while there are little wonders to be experienced in everyday life, the real privilege comes into play. There are amazing things to be seen in your local area, but the culture and history we have access to is nothing in comparison to what the literal birthplace of Christianity has to offer. From tiny tiled mosaics to subway stations full of bustling people and so much more. If we were to recommend a real bonding experience that can double as a way to put your child’s world education above and beyond, we’d recommend Rome, Italy. Rome has been around for so long because the foundation that men like Caesar and Constantine laid for the city. Set the right foundation for your child by investing in their education from the very start. At Resurrection Christian School, we’re interested in providing our students with the sort of education that creates well-prepared adults who are cultured, well-advised and have the proper idea of who God is in their life. Reach out to us to find out more about enrollment opportunities and more now. 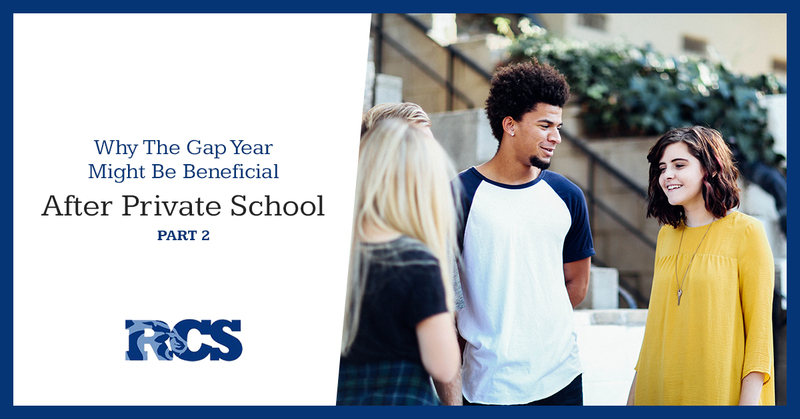 If you’re joining us late, be sure to go back and catch the intro to our ideas about the beneficial uses of a gap year between high school and college. As we mentioned in our previous entry, the gap year develops the child’s prefrontal cortex which develops their worldview as well as their personality and rounds them out their expectations of reality. One of the major advantages for most kids and their parents alike is the financial hiatus. If you’ve been spending money to give them a classical education for the majority of their life, a financial break might be highly valued for you and also for your child if they’re preparing to go and support themselves at college, even if you’re prepared to pay for their tuition. As more people go to college and get worthless degrees the number of people who have only a pile of student debt to show for their 4-year college degree rises. Kids who feel the need to switch majors in the middle of their college career stretch the costs out, making the whole ordeal more pricey. Studies are finding that a gap year might reduce the number of folks who change their major in the middle of their college career. Gap years are praised for assisting people in deciding what they’d like to study and helping find their passions and what they’re best suited to in a way that unfiltered education cannot. College is rigorous and while RCS does everything we can to prepare children academically there are a variety of challenges that nothing but real-life experiences can prepare them for. While there are a host of support systems and other channels that Christian private schools provide for children, there is still a cost for going to college too early and that is mainly the taxing nature it takes on a person’s mental health if they’re not prepared. 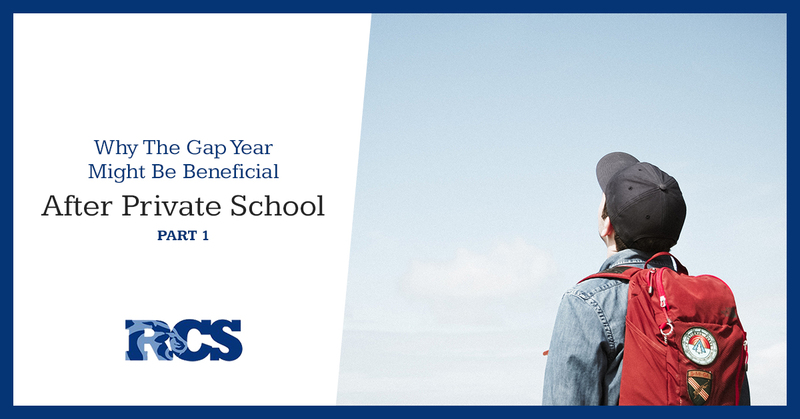 The idea of the gap year is to take kids out of their safe zones and thus improve their self-confidence and help them gain a sense of self and adaptability which can be a powerful skill set to earn before entering college. College environments are full of lack of sleep, constant activity and high levels of stress that past experience in adaptability to a variety of situations will help kids tackle those things like pros so they can focus on the new chapter of their life and what obstacles will help them grow the most as people. If you share our opinions about education and religious ethics you’d fit in perfectly at RCS. Enroll your student today to give them a well-rounded education that includes Christian values. Reach out to us with any questions or concerns. We’d be happy to talk to you about our private school curriculums and ideals. Some people go so far as to criticize private schooling at times, mentioning that there is a limited pool of social growth that a child can acquire when they’re submerged in a controlled environment. For several reasons, Resurrection Christian School is careful to push back against those claims, but we can also see how, even through RCS provides a large environment for children to build many social skills with fellow Christians, we understand the need for real-world experience. If, as a parent, you’re more concerned about this valuable outside world experience being cultivated in your child, we have one suggestion that is earning more respect as the years go by: the gap year. Sometimes, Europe is ahead of the curve with certain things and in this case, they certainly are. Germany, the UK, Denmark and even Australia and Israel encourage students who have just graduated to take a gap year in between their studies. This time can be used to travel, serve the church, serve in the military or work before moving on to their college studies. However, the current U.S. climate regards gap years with a collective panic. Surely, if your child takes a gap year, they’re destined to not do as well as others. The growing consensus is that it isn’t quite true anymore. The idea is that if children get a taste for the non-school life they’ll realize how important it is to go back and it will give the privilege of going to college and earning a degree a new glow. In fact, psychologists at large are not worried about kids not wanting to go back to school as many studies done on the subject found that around 90 percent of the kids that take a gap year return to their studies with new fervor. The studies concluded that a very important brain growth period between those two school periods allows for the person to grow socially and within their understanding of the world. While a gap year isn’t for everyone, it has quite a bit of scientific data backing up the benefits for those it catches the fancy of. The prefrontal cortex is continually expanding in the late teen years and it is the section of the brain that develops the child into an adult with an adult personality. It controls your propensity for planning and draws complex conclusions from data. In other words, it’s the largest jump in growth in the form of maturity that your child will see in their lives. Thus, when the gap year comes to a close, they’ll nearly be a different person with a new understanding of themselves and college as a growth opportunity. Share our opinions about classical education, child growth and ethics? Enroll in RCS this semester. Catch the continuation of our argument for a gap year on our next blog.